Keeping sodium levels in check will help keep the body healthy in the long haul, but even a minor slipup can have you feeling uncomfortable. If you're feeling bloated after a salty binge, each of these tips can have you feeling lighter. Hydrate, hydrate, hydrate. Drinking water helps your body in so many ways, but it should be your new best friend after consuming too much salt. It may sound counterintuitive to drink a lot when feeling bloated, but it will help you feel better and move the salt out of your system sooner. Load up on potassium. You can reach for supplements, but eating fruits and vegetables that are rich in potassium lowers sodium levels naturally. Chow down on a banana, potatoes, or some leafy greens to load up on this electrolyte. Boost Your Metabolism With This 10-Minute Workout! Sweat it out. Even if you're not feeling your best, doing cardio is some of the best defense against your sloth-like symptoms. Whether you head to the gym or hit the pavement for a good run, you'll definitely feel better after exercising. If you're lucky enough to have access to a sauna or steam room, this is a huge help as well for the body to sweat out toxins and impurities. Cut back. Be sure to cut back on salt intake for the days following your binge. Focus on eating healthy, natural whole foods—especially fresh fruits and vegetables! 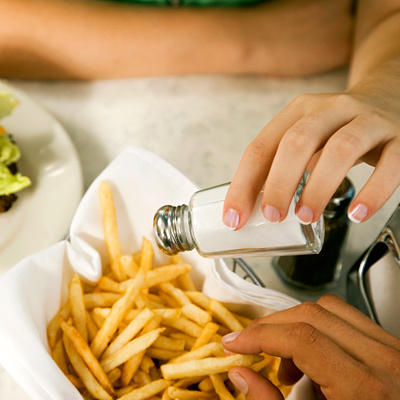 Don't sprinkle salt on your food at mealtime, and choose low-sodium snacks during the day.